Have you ever wondered about chakras? It seems to be a word that is becoming something we hear more and more. Exactly what are they? How do you pronounce it? Where are they? What do they do? Here is an explanation that will help you to understand the concept of chakras. We all have a physical body that is surrounded by layers of energy, 7 of them actually, these are referred to as your ‘aura’. A chakra, pronounced , ‘shark-ra’ or ‘chark-ra’, is where the physical and energetic layers meet. They sit at the front & back of your body and extend through and meet in a line of energy that extends up through the centre of your body from your perineum up to the top of your head. 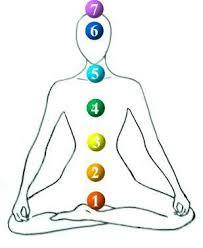 The chakras are all inter-related and if one is off balance, it can affect the next one in line. There are 7 major chakras, and 21 minor, but the major chakras are the ones we hear about most often. Each chakra is related to an energy layer in your aura, particular parts of your physical body, a colour and specific lessons. Chakras nourish and support areas within the body, if they are too open or too closed, or a little dirty, you may feel this physically, or emotionally. Below is a brief overview of each chakra, starting from base to crown. Base Chakra: 1st layer of aura, colour red, related to pain and pleasure. Lessons relate to the material world and your identity within a group. Sacral Chakra: 2nd layer of aura, colour orange, related emotions and feelings. Lessons relate to sexuality, work and physical desire, partnerships & choice. Solar Plexus: 3rd layer of aura, colour yellow, related to mental function and clear thinking. Lessons relate to anger, ego, personality & self-esteem. Heart Chakra: 4th layer of aura, colour is blue, related to the power of words, ability to speak up & take responsibility for our actions. Lessons relate to will & self-expression. Brow Chakra/Third Eye Chakra: 6th layer of aura, colour is indigo, related to celestial or higher love. Lessons relate to mind, intuition, insight & wisdom. Crown Chakra: 7th layer of aura, colour is purple or white, related to higher mind, blending of spirituality & the physical. Lessons relate to allowing spiritual awareness. So, how do you keep your chakra’s clean, or open or closed at the right level? When should I do it? Easy to do and can be done in a few minutes or for an hour, its totally up to you. Do it when you are feeling a little ‘off”, not quite here, a little sad, or when you just don’t feel right. Here is one way. Sit comfortably, eyes closed, and imagine your base chakra as a whirlpool of spinning red over the very lowest part of your torso. Notice it’s colour, is it bright and vibrant, a little dull or blotchy, slow & sluggish? The aim is to have it spinning fast but balanced, and shining brightly. I imagine pouring bright white love into the spinning vortex to clean it. You can visualise the darker colour spinning out of the whirlpool and dissolving away, or imagine placing your hand into the centre and catching any negativity and removing it. When it seems clean and vibrant and spinning in a balanced way, move on to the next chakra. Continue until all have been cleaned and balanced and shining brightly. Open your eyes and happily continue your day. You just meditated! Sometimes work on the chakras arises during a kinesiology session, it can be very powerful and offer amazing insight to the issue at hand. If you have any questions about chakras, please contact me or leave a comment.